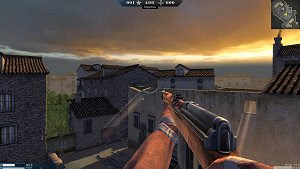 Army Rage is an online first-person shooter set in the World War II where players may enter the fight between the Axis and the Allies. The template is standard, similar to games such as Combat Arms and Project Blackout, offering different classes, several authentic weapons (such as a flamethrower and a rocket launcher) and even tanks to eliminate your opponents. As usual with this kind of free to play games, graphics are not the most impressive, with some nice but far from polished scenarios. Fans of fast-paced shooters will surely enjoy the gameplay in Army Rage and ignore some minor bugs.